The sun is peeking out more and more as Spring is in full force! Many of us soak that sun up like little sun lovers, but for some, the sun can be quite dangerous. Our children need protection from the sun in ways that we don't always consider. I use a strong sun screen on my kids and for some that would suffice. My daughter however has a skin condition called vitiligo and she has to basically have her skin covered to prevent sunburn. She does not have pigment in much of her skin and it burns immediately. She can't walk around with long sleeves and heavy clothes all summer, so it is really important for companies like Baby BanZ to create their breathable clothing that covers and protects! "Hailing from the land down under, Baby BanZ understands the importance of protecting children's delicate skin from the harsh rays of the sun. They've create a child focused brand of swim shirts, suits, and trunks that kids adore playing in while parents enjoy the UVA and UVB protection they provide. Dress up their regular suits with the addition of a Short or Long Sleeve UPF 50+ Rash Top. 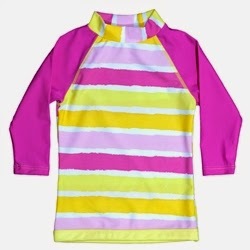 These thin, loose fitting shirts offer pops of cheerful colors without getting in the way of their playtime, and look fantastic when paired with a color-coordinated bottom"
This long sleeve UV Rash Top in sun blossom stripe, provides UPF 50+ and is the perfect protection! Chemical free, light weight and incredibly comfortable! They have these from infant to size 12 kids. Cover all of your kids this summer! They also sell protective shorts, skirts, hands and sunglasses. You can get your complete outfit from Baby BanZ!